MoonMarble.com - Assorted Game 9/16"
Bulk Marbles → Decor Marbles - approx. 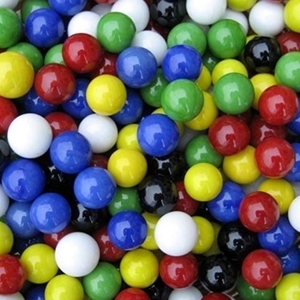 14mm or 9/16" → Solid Colored Game Marbles - 9/16" → Assorted Game 9/16"
The 9/16" or 14mm diameter game marbles are opaque glass and may be purchased in assortments of the basic 6 colors. They are also available in assortments of 4 or 8 colors. If you would like a custom assortment other than the options listed, specify in your item notes which colors you would like to order. Warning! : Choking Hazard. This toy is a marble. Not recommended for children under 5 years. You will receive 10 marbles of each of the basic 6 colors; red, yellow, green, blue, black, and white. The 4 color and 8 color assortments are not an option for this set. However, you may substitute colors, which you may specify in your order notes. There are approximately 100 - 120 marbles in the 1 pound bag. The number of each color in the assortment will vary. There are approximately 250 marbles in the 2.25 pound bag. The number of each color in the assortment will vary. There are approximately 500 marbles in the 4.5 pound bag. The number of each color in the assortment will vary. The Game Maker's Case contains even weights of each of the 6 basic colors (red, yellow, green, blue, white, and black), and nearly even numbers since the density of glass varies by color. The case contains approximately 3,000 marbles.